Some statistics are available from the Brazilian (INPI) indicating and releasing some numbers in regards to its services in February 2016. The following applications are noted: 2,372 patent deposited; 11,626 trade marks; 498 industrial designs; 91 computer programs; and 81 applications for registration of contracts technology (technology transfer). INPI observes that patent applications were unchanged as compared to those in January. In the case of trade marks and computer programs applications there was an increase if compared with same time in 2015. There was however a decline in applications for industrial designs and TT contracts. In Brazil TT contracts (incl. technical services and technical assistance) and similar contracts must be registered with INPI to have effect on 3rd parties. But note that INPI neither annotates agreements nor issues certificate of registration for the license of non-patented proprietary technological knowledge. Also note that INPI assessment and approval of TT and IP licensing agreement is mandatory for the purposes of a) authorizing remittance of royalties to foreign licensor, grantor of IPRs recognized in Brazil; b) trigger tax deductibility by the Brazilian party of amounts paid in connection with IP license, acquisition; and c) entitle the Brazilian party to enforce licensed, granted IP rights. After INPI’s registration, agreements must be registered with the Central Bank of Brazil (Law No. 4,131/1962 regulates foreign capital in Brazil). If you have an interest and/or knowledge on a non-EU country jurisdiction (it is you Latin and Caribbean (LAC) countries) do please complete the on-line survey (one per country). The survey started to run last Monday and will be available until the 31 May 2016 (accessible here). In a recent presentation that I did at ELAN, Brussels 8th March, after explaining the topic of technology transfer and IPRS and looking the process in 5 selected Latin American jurisdiction, one question remains: will an invention/creation be protected as a matter of fact? Then it is suggested to observe the World Bank data which provides a variety of measures for a country. In the presentation, and using this point, I proceeded to build a chart for the 5 countries that I was studying , namely Brazil, Chile, Colombia, Mexico and Peru. I added to these countries the host country of the date, that is Belgium, so that the audience could compare and contrast the statistics and data. The chart reflected the very poor state of the countries’ regimes (exception been Chile which was very similar to that of Belgium). The indicators that I selected were: Control of Corruption; Government Effectiveness; Regulatory Quality; and Rule of Law. The aggregate indicators were ‘estimates’ giving the selected country's score in units of a standard normal distribution, ranging from -2.5 to 2.5. The latest data came from 2014 and I looked at 3 years (from 2012-2014) to see and establish a pattern. Hopefully, the numbers do speak for themselves. And because of this, we encourage you to participate in the survey. Among others [actions points are found at page 19 on this report here). The event was seen as a great opportunity to exchange information among the participants. IMPI’s Director General observed that approx. 52% of Mexican patent applications are made by research centers and universities, acknowledging the importance of strengthening the links among the administrative offices granting patents and the industry as well as understanding the needs of the industry. The Director also noted that in Mexico, “innovation policies are associated as instruments of public policy and play a key role in promoting Mexican creativity,” and thus, noting the relevance of the IP system. Mexico is a member of the Patent Cooperation Treaty (PCT) known as international patent. There are more than 20 Latin American countries that are members of the PCT allowing members to pursue patent protection for an invention simultaneously in a number of countries by filing a single international patent application, However, note that the granting of patents remains under the control of the national IPO (called the ‘national phase’). IMPI is the only Latin America office which has signed an agreement with the European Patent Office taking advantage of a fast-track examination procedures in the national phase i.e. Patent Prosecution Highway. As of May 25, 2010, the USPTO has eliminated the fee for the petition to make special under the PPH programs. Also there is a PPH pilot program between the USPTO and the IMPI that commenced on July 1, 2015, and will run for a period of one year ending on June 30, 2016 (more info here). Patricia Covarrubia, “Protection of non-agricultural GIs: a window on what is happening in Latin America”, European Intellectual Property Review, E.I.P.R. 2016, 38(3), 129-131. Dr Covarrubia compares different national legislations in Latin American countries as well as observing the Agreement on Trade-Related Aspects of Intellectual Property Rights 1994 (TRIPS, WTO) and the Lisbon Agreement for the protection of appellation of origin and their international registration (WIPO). The publication is based on a paper presented in September 2015 at the Symposium on Geographical Indications (GIs), sponsored by Grana Padano and CIIPM. The symposium covered the policy aspects as well as the practical implications, challenges, and opportunities that GI involves. Nick Coppola who is currently writing his PhD on "The EU Agricultural Quality Policy Reform" was the one that organized such a wonderful event (a nutshell of the event can be read here). Nick has also wrote a couple of post for this blog in the topic of GIs. Indeed, we can not wait to read his thesis which surely will become a monologue published by a reputable editorial in the UK (hopefully I will read it before it becomes expensive). 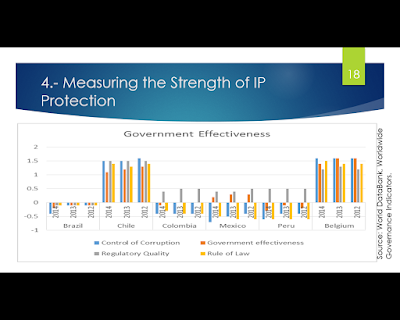 For more information on GI in Latin America, specifically in the trade bloc Mercosur, there is a webinar provided by the Latin America IPR SMEs here. The Brazilian National Institute da Propriedade Industrial (INPI) together with the Ministry of Development, and the Industry and Foreign Trade (MDIC), have signed a technical cooperation agreement with the Brazilian Support Service for Micro and Small Enterprises (Sebrae). The agreement will be valid for three years and aims to make small business more competitive and innovative, “stimulating the development of technologies and the use of technological information contained in patents.” The agreement will see document production such as: fact-sheets, guidelines, tutorials and other material on industrial property to guide enterprises on the use of theirs assets, and how to request applications for industrial property among others. The Peruvian National Institute for the Defense of Competition and Protection of Intellectual Property (INDECOPI) is promoting the online application for copyright. The ‘Virtual Registry of Works’ is a friendly platform, it is accessible anywhere and at any time (it operates 24hrs). INDECOPI notes that the system allows registration of works in 24 hours if the application does not present any observations. Payment can be done also online by credit card or through the Banco de la Nacion. There is an online tutorial on how to use this platform (here). While registering a work is not mandatory in Peru, it is highly recommended to do so to facilitate prove of entitlement and date of creation. The Peruvians claim to be the leader in the protection of genetic resources and Traditional Knowledge (TK). This recent statement was submitted to the Asean-Pacific Economic Cooperation (APEC) member economies claiming that the Peruvian Commission Against Biopiracy (INDECOPI) has developed a strong and solid system to prevent biopioracy. Biopiracy is known as the unauthorised collection and/or use for commercial ends of genetic resources or TK. The Biopiracy Commission aims to track and identify cases of biopiracy around the world. In this way it prevents and protects Peruvian biological resources and TK by opposing to patent applications abroad and/or challenges granted patents. The Peruvian legislation in regards to biopiracy comes in the form of a trade bloc Decision i.e. the Andean Community (CAN, whose members are Bolivia, Colombia, Ecuador and Peru) Decision 391 ‘Establishing the Common Regime on Access to Genetic Resources’. The report shows that the Biopiracy Commission has resolved 15 cases, 6 of which related to ‘maca’. Patents granted using ‘maca’ for the production of medicaments for the treatment of osteoporosis, insomnia and to increase testosterone and as a nutritional supplement were successfully invalidated after the Commission intervention in Japan, Korea and Europe. Other cases have been successful at early stages since the Biopiracy Commission has opposed to the patent applications.